One of my favorite things to do in the summer on cooler days (and especially nights!) is pair a chunky summer sweater with a pair of denim cutoffs. I don't know why I love it so much, but it's just so cozy! It reminds me of the seemingly endless summers from when I was a kid where my friends and I would hop from house to house and bon fire to bon fire. I also love to keep my accessories simple when it's so hot and humid out. There's nothing worse than jewelry sticking to you or making you sweat. Umm....eww. Which is why I'll often opt for a single bangle or, in this case, a classic watch. 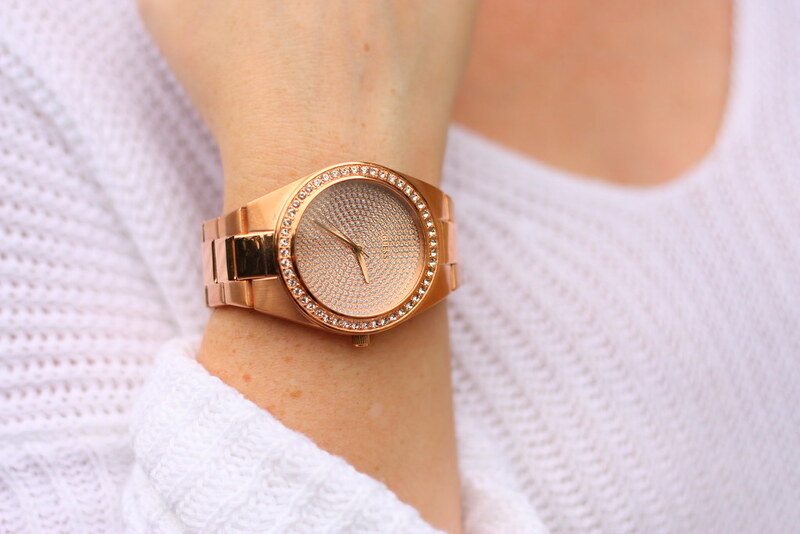 This one from GUESS is a gorgeous rose gold color, which is the perfect metal for summer if I do say so myself. It has just the right amount of sparkle, too, which is always a must for this girl! I love this look! the slouchy sweater and the cut offs with the heels are perfection! Totally agree with you about minimal jewelry in this heat - I've been wearing less & less lately! Love the slouchy sweater + cutoff combination with dressier heels...definitely adds that chic factor! I keep everything to a minimum during these summer heat waves! Love the combination of a sweater and shorts. Love the slouchy sweater and swooning over that clutch! Such a great piece! This is such a great chic-comfy outfit -- and I love how you topped it off with a perfectly casual topknot! This looks perfect for a summer night-- and I am loving that clutch. Too cute! Perfect look for the summer! You look awesome! Great sweater! Love this whole look, but I'm amazed you were able to wear long sleeves and not melt! Love this outfit! That sweater is just the right kind of fab that I've been searching for!